A big weekend of films meant I saw rather more Helen Mirren and Guy Pearce than is average for me. Some of the 10 titles I managed to fit in weren’t that great, or offered little unexpected to say – yes, The King’s Speech was excellent and is certainly highly recommended, but that’s hardly a surprise at this point – but there were some unexpected treats too. Chief among these was Catfish. I went in knowing little about it, and what I did know turned out to be wrong (I’d been mixing it up in my head with a different film). This turned out to be the best way to see it, and I’d advise doing the same if at all possible. It’s a documentary that follows photographer Nev Schulmann, his filmmaker brother Ariel and their collaborator Henry Joost after Nev strikes up an online friendship with a talented child artist (who has painted a copy of one of his photos and sent it to him). He also becomes close to her family, particularly her older sister. At times it’s fairly uncomfortable viewing, and left me feeling that I was watching something that should have been left private. You can’t help but question the filmmakers’ motives for continuing with the production, though Nev is seen to act with considerable sensitivity and dignity in the later scenes. Some may also wonder if the fly on the wall material is genuine (certainly one person at the screening believed the whole thing to be a scam, not an opinion I share). Either way, it’s a fascinating story. If you though the only thing wrong with The Reader was that it didn’t have enough guns and fights, then John Maden’s The Debt is very much the film for you. Helen Mirren gives some serious accent as Rachel Singer, an ex-Mossad agent whose daughter has written a book about her most famous mission – the capture and killing of a notorious SS war criminal. Cue flashbacks, plot twists, betrayals, the works. I’d heard bad things about this one, so my expectations were low enough that I actually enjoyed myself. It’s a potboiler, and a rather self-important one, but entertaining for all that. Mirren also had her classical hat on for The Tempest, Julie Taymor’s latest Shakespeare adaptation, playing the renamed Prospera in a gender swap that works perfectly well. Most of the rest of the cast are good as well: you get that nice Felicity Jones as Miranda, classy US types Chris Cooper and David Strathairn, plus Russell Brand. Brand looks just like he always looks, but is fine in the comic role of Trinculo, and manages (like Mirren) to make Shakespeare’s lines sound like normal dialogue. The only weak link is Reeve Carney as Ferdinand, who really is extraordinarily wet. Given the play’s subtexts though, I’d be interested to know if Taymor thought long and hard before casting Djimon Hounsou as Caliban. I’m not saying it was a bad idea, I’m just interested. The film looks spectacular. The locations – it was filmed in Hawaii – are stunning, and various scenes are augmented by CGI, most extensively with the transformations of the spirit Ariel (I was reminded of Dave McKean’s film Mirrormask at several points). But you never get a proper sense of the geography of the island. Instead, various groups of actors step out onto the stage, do their scene, and are replaced by others – always a risk with theatrical adaptations, of course. 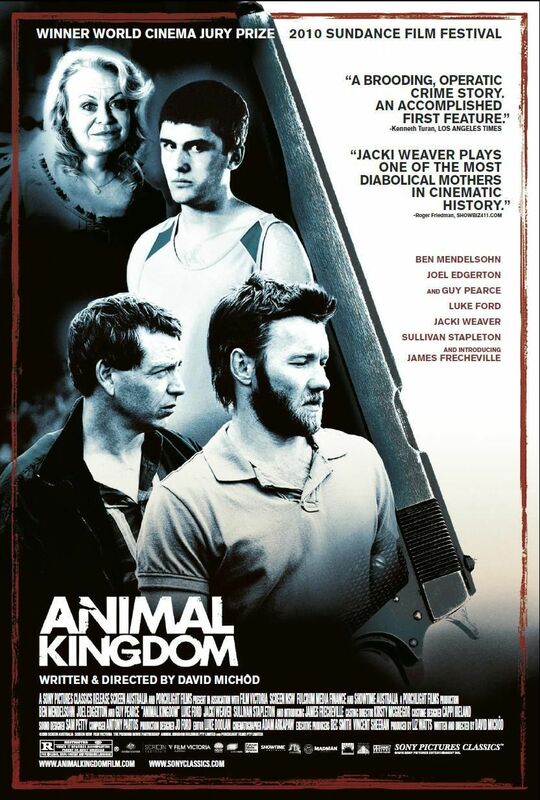 Finally, another highlight – David Michôd’s Animal Kingdom, an excellent Australian crime drama following Josh (James Frecheville), a 17 year old who is taken in by his criminal family when his mother fatally overdoses. Already you can see that the odds are not in his favour, and soon he’s being drawn into his relatives’ nefarious activities – which are notorious enough to draw the attention of the ruthless Armed Robbery Squad. These relatives and their associates range from reasonably decent (Joel Edgerton as Barry, Luke Ford as Darren) to dangerously unpredictable (Ben Mendelsohn as Pope), headed by the thoroughly loathsome mum from hell Janine (Jacki Weaver). Frecheville plays Josh with a blank-eyed reserve that could initially be mistaken for woodenness, but is in fact a very good portrayal of an inarticulate and confused youth. Guy Pearce is also in there as the cop trying to persuade Josh to stay on the straight and narrow. There’s considerable doubt over which path he’ll take. It’s a terrific feature debut from Michôd. This entry was posted in Reviews and tagged Animal Kingdom, Catfish, Guy Pearce, Helen Mirren, The Debt, The King’s Speech, The Tempest on November 18, 2010 by Gareth Negus.